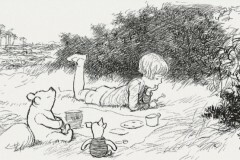 Profoundly Motivation from Winnie the Pooh: The Smallest Things Sometimes Is So Important! All the people and all the things you hate, constantly live in your head and heart, and take up a lot of space there. So, if a person really wants to get rid of something or someone he should forget about hatred. To begin to move on, turn off this feeling and never look back.